Violence, Hardship Fuel Central American Immigration To U.S. While Mexican immigration to the U.S. has slowed in recent years, the number of Central Americans heading north has been on the rise. Last year, the number of illegal border-crossers caught from countries other than Mexico hit nearly 100,000 — more than double the year before. 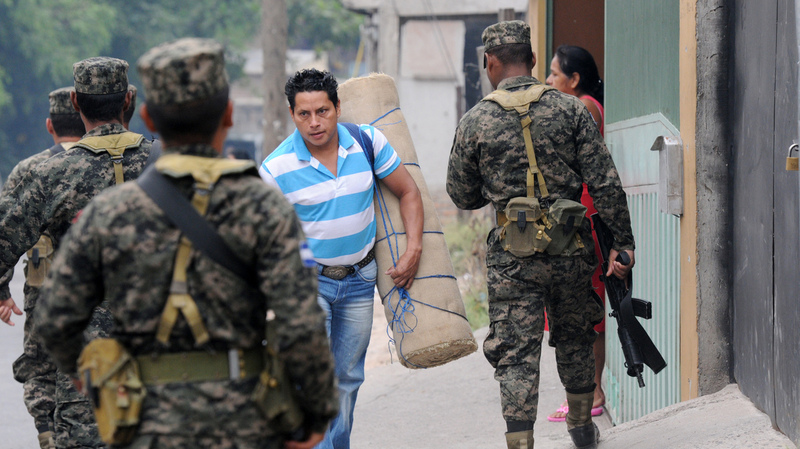 Honduran Army soldiers patrol streets in Tegucigalpa, Honduras, in April. Gang violence has many Hondurans fleeing to the U.S. The men didn't care, so Ordonez went to the police. He says instead of helping, the police told the gang that Ordonez and his wife had complained. The next day, there was a note on the small store door that said: "We are going to kill you." "The first thing we thought to do was to save our lives ... we took off," he says. Ordonez, his father, his wife and their 7-year-old-son all headed north. After a month of traveling hidden in the back of pickup trucks, in small boats and on the top of trains, the family made it to a small refugee center in a poor neighborhood in Mexico City. While Mexican immigration to the U.S. has slowed in recent years, the number of Central Americans heading north has increased. Last year, the number of illegal border-crossers caught from countries other than Mexico, mainly from Honduras and El Salvador, hit nearly 100,000 — more than double the year before. In Costa Rica on Saturday, President Obama pledged to increase educational and job opportunities in the region. Arturo Condo, who heads a prominent business school in Costa Rica, says more than 40 percent of the Central American population is under the age of 24 and suffers the highest levels of unemployment. "More than 30 percent of them don't study, and they don't work either because they don't have neither the opportunity for education or work," Condo says. Lack of economic opportunity is driving them north, but so is the unprecedented level of violence in the region. The city of San Pedro Sula in Honduras now has the highest murder rate in the world. At the refugee center in Mexico City, six more Honduran men arrived in the last few weeks. They are all relatives from San Pedro Sula. One of the men, 28-year-old Ivis Carcamo, says gang members had killed his relative and then sent threatening text messages saying the rest of the cousins were next. That day, they fled. Meanwhile, with the exception of the grandfather, Renee, the Ordonez family is no longer at the refugee center. He says they paid a smuggler $2,500 each to get across the U.S. border, and they are now in Houston. Renee Ordonez says it was so sad saying goodbye to his son and his family. "I never thought I would be left here alone."